TMC, a global, integrated media company, has recently named VOZIQ’s Predictive Text Analytics Platform as a 2018 Unified Communications Product of the Year Award winner. 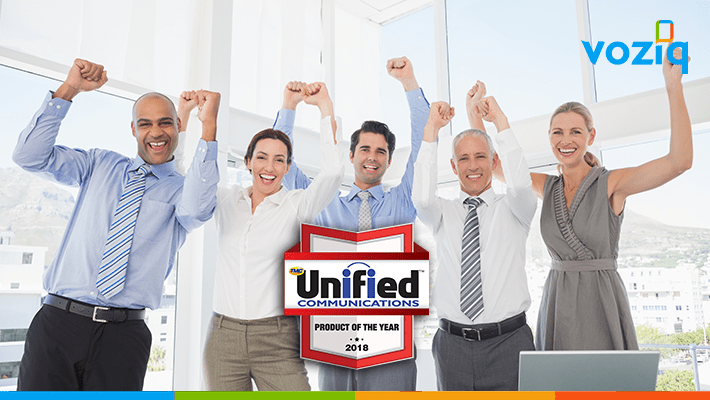 This award honors the best, most innovative unified communications products and solutions available over the past twelve months as judged by the editors of TMC’s INTERNET TELEPHONY magazine. Customer churn is a fact of life for any recurring revenue business, and a small change in it can compound to a disproportionate impact on bottom line. For example, in industries such as Wireless or Healthcare, a 0.25% to 1% increase in customer retention can mean millions of dollars in saved revenue in addition to a higher customer lifetime value. However, many companies struggle with the churn problem due to the late recognition of churn risk for a particular customer. “Early risk detection is paramount for the success of any customer retention program as it creates windows of favorable opportunities for saving upset customers,” says Suresh Akula, Co-Founder and CTO at VOZIQ. The latest advancements in AI and text analytics have come to rescue enterprise subscription businesses. AI enables crunching large sets of data, real-time analysis involving millions of records, building customer intelligence, and predicting a customer’s next move. This presents an opportunity to deal with the problem of customer churn more effectively. Why is AI adoption low? In spite of this huge opportunity, according to McKinsey, just 20% of the surveyed executives use AI-related technologies in their businesses. The adoption is so low because of executives associating the implementation of AI with big problems that warrant huge investments and longer implementation cycles. VOZIQ’s Predictive Text Analytics Platform leverages AI advances and applies them to the very specific problem of identifying churn risk early in the customer lifecycle so that retention teams have sufficient time to proactively engage with the at-risk customers. VOZIQ’s platform comes with machine-learning models and text analytics in order to analyze huge piles of contact center customer interactions and other customer data sources so as to predict behavior and risk for every customer. Seamless Data Integration: VOZIQ provides a unified data movement layer that can execute data movement to and from a broad array of systems, such as CRM and IVR systems, to VOZIQ’s platform in a seamless manner. Text Analytics and Machine Learning: Unstructured data such as agent notes are gold mines of clues about customer behavior, expectations, and overall satisfaction. VOZIQ’s text analytics engine converts this unstructured data into meaningful insights about customer intent, effort, and sentiment, as well as the root causes of dissatisfaction and churn risk. Machine learning algorithms then use these as inputs and uncover hidden churn risk in addition to predicting future satisfaction (Predictive CSAT) and churn risk levels for every customer. Facilitating proactive retention: VOZIQ enables integrating the risk predictions with IVR systems to automatically hijack calls from customers based on predicted risk or next call reasons and route them automatically to the best-trained group of agents for proactive engagement and offer delivery. Agent cockpit: VOZIQ also empowers customer care agents to offer the personalized engagement and data-driven marketing offers by integrating the risk score as well as other customer intelligence from VOZIQ with the call center CRM systems. This leads to enhanced customer service experience and higher offer conversion rates. “VOZIQ aims at providing an end-to-end solution to enterprise subscription businesses to drive CX-led, proactive retention efforts instead of being reactive, and do this while keeping the offering closely aligned with enterprise needs of speed, security, and reliability. The 2018 Product of the Year Award is a testimony to VOZIQ’s commitment to business goals of our clients,” emphasized Suresh.